Sedum makinoi 'Ogon'. 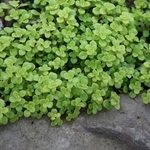 This Gold Japanese Woodland stonecrop quickly forms a dense mat of bright yellow foliage. The flat tear-shaped foliage is quite different from the traditional thick succulent type in the sedum family. It looks great in containers, spilling over the edge and adding alluring brightness. The more sun it is exposed to the brighter the golden color, however full sun in the south can be disastrous. Grown as an annual in the north.